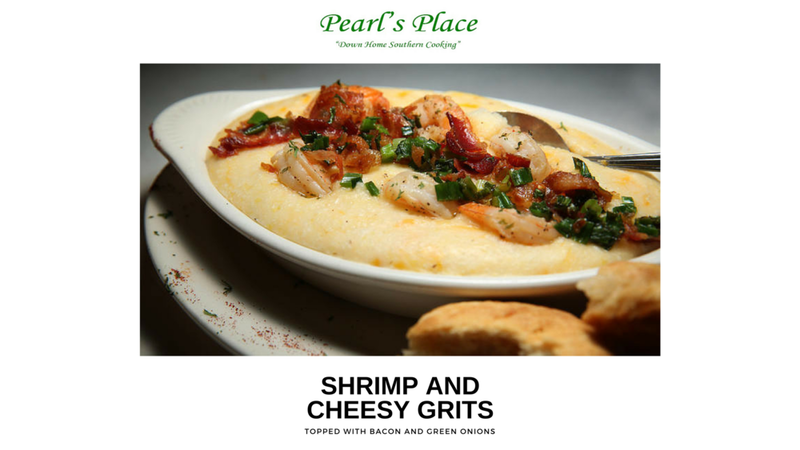 Pearl's Place Egg Meals: One Egg... 4.99 / Two Eggs 6.99 / Three eggs... 7.99 Served with Home Style Potatoes, Rice or Grits and Biscuits, Wheat Toast or 2 Pancakes. Meat selections available for additional charge. Served with Home Style Potatoes, Rice or Grits, and Biscuits, Toast or 2 Pancakes. Meat selections available for additional charge. Bacon, Sausage Links, Turkey Patties or Corned Beef Hash, add...4.29 each. Parker House Spicy Sausage, add... 5.29 each. Beef Chopped Steak, Country Fried Steak, Turkey Chopped Steak, Chicken Wings, Catfish Fillet, Pork Chop, Salmon Croquet or Baked Ham, add..6.29 each. Prices and available selections subject to change. Ask your server for current pricing and additional choices. 12ozs of Slow Smoked Ham Hock, truly a delicacy! We serve fresh eggs, made-to-order Omelets ... and Waffles, along with a tasty selection of homestyle breakfast sides, like grits, rice and potatoes, a variety of meats, like sausage links, salmon croquettes, turkey patties and Parker House spicy sausage. And yes, chicken wings! An appetizing selection of offerings from our famous soul food menu. Now including breakfast - all day! The ultimate feast of the best of our famous soul food menu, and more. Now including breakfast - all day! Our buffet selections are carefully selected by our chef throughout the day and are subject to change. Selections may or may not include items from the regular menu. Slight charge for buffet carry-outs. We have a no waste policy; please only select items you are prepared to eat. Buffet sharing is not allowed. Our delicious desserts are not included in buffet pricing, but are offered at a special price with your buffet. Please ask your server for available selections. Beverages are not included in buffet pricing.